Here’s what was waiting for Big Boy when he came home from school today. 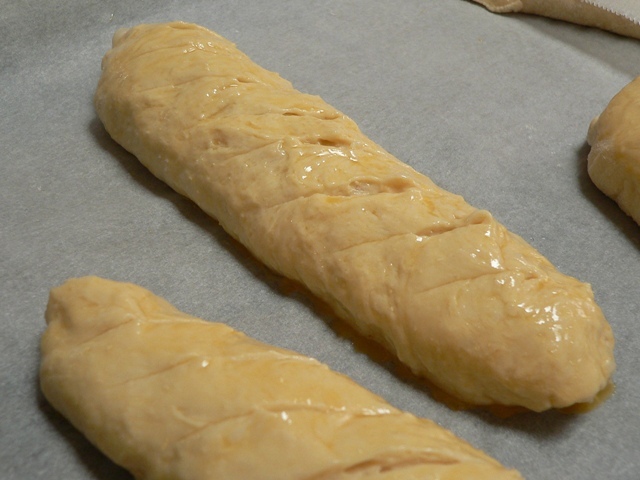 I’d made pain viennois à la Richard Bertinet, using a recipe from his wonderful book Dough. 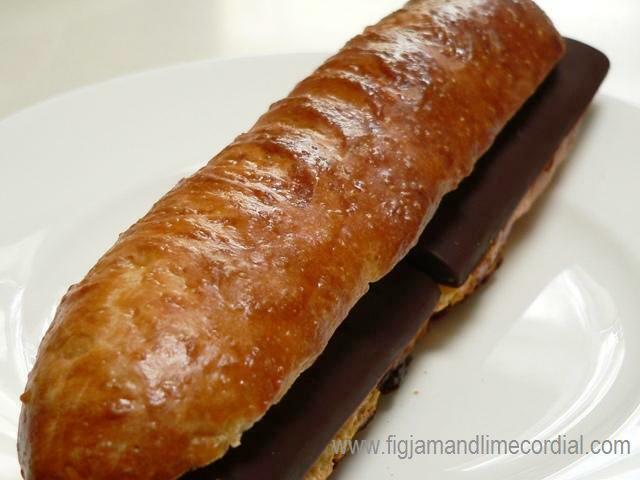 This after school treat is traditionally served with a stick of chocolate; in this case a bar of tempered Callebaut 70%. It was a surprisingly delicious combination. If you haven’t tried this sweet dough recipe, I hope the photo will encourage you to give it a go. It’s a very useful addition to your bread baking repertoire. Our jam doughnuts were made from this dough, as were the hot cross buns we made at Easter. Because it’s not overly sweet, the dough can also be used for savoury items – Bertinet’s book includes recipes for a bacon slice and croque monsieur, both based around this recipe. Note: UHT milk has a long shelf life and is purchased in cartons from the supermarket shelf. 1. Whisk together the dried yeast and bread flour in a large, wide mixing bowl. Add the salt and sugar and whisk in well. 2. Add the unsalted butter, cut into small cubes, then rub the butter into the flour mixture until well crumbled. 3. Add the eggs and milk, then mix together with a spatula until it forms a shaggy dough. Cover with a tea towel and allow to rest for 10 minutes. Note that this recipe uses two eggs – the photo below was from a double batch. 4. Knead the dough until smooth. 5. Oil the scraped-out mixing bowl, then return the dough to the bowl, cover with clingfilm and allow to rise until doubled in size (about an hour). 6. Turn the dough onto a lightly floured surface and gently fold it onto itself. Divide the dough into five pieces, then shape each piece into a long roll. Place the baguettes on a tray lined with parchment paper, allowing room to spread. Brush each roll with two coats of beaten egg, before making several deep cuts diagonally across the top with a razor or sharp knife. Preheat the oven to 200C (with fan). 7. Allow the dough to prove for second time until puffed up, then bake in the preheated oven for 10 – 15 minutes, until dark golden brown. The finished baguette has a brioche-like quality and can be used for a variety of sweet and savoury applications. Make sure you try one stuffed with a good quality chocolate bar! YUM!!! What a nice mum you are to have that ready as an after school treat. This recipe was amazing! I made it for brunch yesterday and every body loved it! the process may be long, but I wouldn’t say it is time consuming (since most of the time is spent rising the dough). It is a simple recipe that gives so much pleasure to make and share at the table. One little thing, UHT milk is very common in the US- we can buy it in every supermarket. I’m glad it was a hit! :) Thank you for letting me know about the UHT milk – my friend Dan in CA hasn’t been able to find it anywhere! Perhaps it’s a state by state thing? Anyway, I’ll let her know to have another look. By the way, the sweet dough is very versatile – I use a version of it for hot cross buns, we’ve fried it as doughnuts and I also make a bacon slice from it, the recipe for which I’ll be putting up soon!